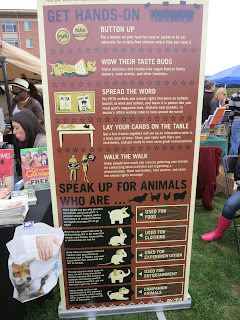 Last weekend, I had the pleasure of attending the Baltimore VegFest, a celebration of healthy, sustainable, and compassionate eating, on the campus of the University of Maryland, Baltimore County. I was amazed at home many people we already there when we arrived around 11:30 a.m., just 30 minutes after it had started. There was a great variety of non-profit organizations, food manufacturers, cafes, and bakeries. Some of the non-profit organizations included PETA, Compassion Over Killing (COK), The Humane League, Mercy for Animals, FARM, PCRM, and Sea Shepherd. Below you will see the professional representatives from Vegan Outreach. I caught Jon Camp licking his plate. I don't think he gets to eat much on the road. Food manufacturers were abundant with samples galore! We got hotdogs from Lightlife and kale chips from Brad's Raw Foods. For lunch, we went to The Land of Kush's booth and got the sampler platter that included rice, soy ribs, collard greens, and potato salad. It was delicious vegan soul food at its best. For dessert, I grabbed a salty caramel cupcake from Dirty Carrots. It was oh so delicious with its perfectly moist, dense chocolate cake topped with salted caramel frosting and sprinkles. Delish! Later in the afternoon there were a few speakers like the always awesome Erica Meier from COK as well as someone from Mercy for Animals. My good friend, Elena, even conducted a cooking demonstration. At the end, we collected our goodie bags that were filled with treats from Raw Revolution, Primal Spirit Foods, Soyummi, and headed out. What an awesome event! Thanks to Kate St. John and Aaron Ross from The Humane League and everyone else who helped with this event. With over 1,000 attendees, I think they did a great job. I'm already looking forward to next year!